NEW!! – PRINCESS CRAFT PARTY AND PRINCESS & PIRATE CRAFT PARTY!! Fed up of ball pits, bowling and bouncy castles?! Then why not try something different for your daughter’s birthday. Little Miss Glitz provide a range of fun-filled parties for the Birthday Girl and her friends in your home or chosen venue. Nail painting, makeovers, crafts, games and prizes! Parties for girls age 4 upwards. All make-up and skincare products used are from The Body Shop. Please click on the links at the top of this page for further details about the different parties available. We cover most of Herts, Beds and Cambs. 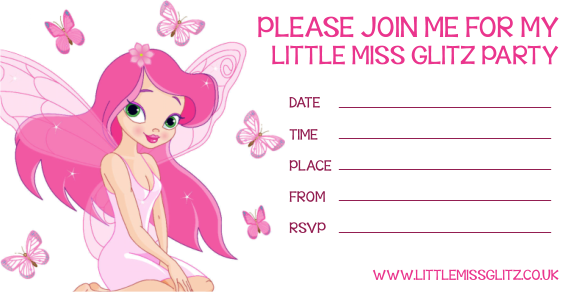 Click here to download a Little Miss Glitz Party Invitation! Right click on invitation and choose ‘save as’ to download the invitation.